Tired of copying text and getting an unreadable, strangely formatted result? You're not alone. Usually, all we want is the actual content - not the Comic Sans font - when we copy a text. Plain Text Copy strips the text you copy of all formatting (font, font size, bold/italics/underline, etc.) leaving you with a plain text to paste. Simply add the Plain Text Copy action and use it whenever you want to copy a text without the formatting. INSTRUCTIONS: Select a text and tap Share... Tap More and enable Plain Text Copy. 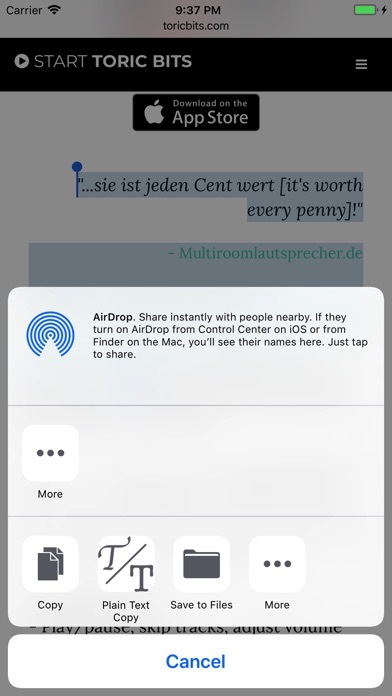 Finally, tap Plain Text Copy to copy the text without any formatting. You can now paste the clean text anywhere you like. Plain Text Copy is also on macOS! You can find it on the App Store: https://itunes.apple.com/us/app/plain-text-copy/id1297888715 Don't hesitate to contact us at info@toricbits.com. We love to hear from you! Works well in principle, but say for example, you want to strip formatting from an email and paste it into the same or a new email draft, the app hangs on the “Done” screen (on both my iPad and iPhone, both on iOS 11.4.1). I have to double tap the Home button, swipe the (in this example) email app off the screen, then do the paste back into an email draft. If pasting elsewhere, this step can be temporarily skipped, but still needs to be done before I can get past the “Done” screen in the originating app. I would just delete the app, but since I paid for it, I want it to work.